Photo: Francis Mack (left) with friend, Jim Stark. 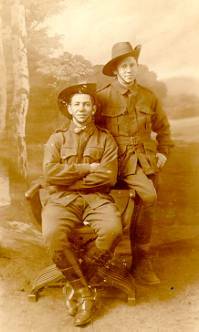 Left: Francis (seated) photographed again with pal Jim Stark. 1st row (standing): Douglas, Drummond Hay, Lowe, Strickland. 2nd row: King, Martin, Perrins, Ross. MACK, Cpl. Francis James, 4330. 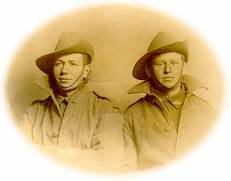 29th Bn.Australian Inf. Died of wounds 29th July, 1918. Age 20. Son of Henry Francis and Eva Mildred Mack, of 33, Parramatta Rd., Summer Hill, Sydney. Native of Cassilis, New South Wales. 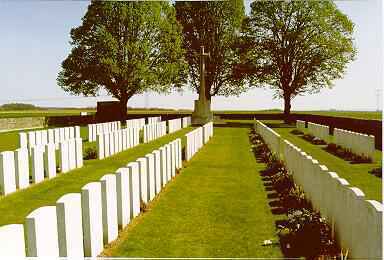 Vignacourt British Cemetery Plot IV. Row D. No. 11. Just back from leave in London. I had a real roaring time. The time (4 days) was rather short. I managed to see most of the old ancient and historical sights. I was somehow disappointed in London after reading so much about it - really expected to see something more impressive than it is. Mind you, we see London now at its worst for everything is in darkness at 5pm in the afternoon so the days were terribly short. I went to see the Tower of London, Buckingham Palace, Whitehall, The War Office, Westminster Abbey, St. Paul's Cathedral, Trafalgar Square, Leicester Square, Piccadilly Circus, Bond Street and other places too numerous to mention. These sights are grand - there are no two ways about that but the rest, the business houses and eating places are only commonplace. The big difference between Sydney and London is the trams. London has no trams through the streets - they all run underground and are all privately owned. There are two classes of trams - the Tube and the Electric Line. The Tube is a way - it Billy O down- say 5 or 600 feet down while the Electric is only about 50 feet. They are very cheap and extra fast. On the streets run O'Buses (Motor) after the style of the trams. There are thousands - you can see them everywhere and these were very attractive to see. You wonder why. Well, firstly you can see London better from an omnibus than anything else and secondly but none the least important is that the conductor is a Girl. That's a thing which struck us as peculiar, girls doing all sorts of jobs, walk down the street and you see a window cleaner. I had seen photos of them in papers but had I not seen them I would not have believed it. But never the less they were there dressed in men's clothes of oilskin. Go a bit further and you see a girl page, girl done up in livery to put it plainly, girls are doing everything. We had theatre parties every evening for there is nothing else to do, it is so dark. Another thing, go in for dinner and after having soup and joints they won't serve you with sweets and when you get your bill they charge for each thing separately. Oh! the difference from Australia. Take a tip from me stay in New South. Sydney is not too bad at all. I was stopping at a friend's peoples place at Kensington, West London and they treated us right royally. London is the thing for the CASH. 4 days - $4/10/- not bad going eh? Well that is all our leave so I made the best of it. Well I can't remember much more now to tell so must close. Tell Mr Cook I went round to see his brother but they couldn't find him and I couldn't wait too long as time is precious while on leave. They have shifted from Horsferry Road and are in a Hall not far from the HeadQuarters, was sorry I missed him. I hope everything at home is OK and that you all are in the best of health. Remember me to relatives and friends. I haven't received many letters from relatives so you can give them my news as it is hard to settle down to write in such cold weather. I'll answer all letters I receive so if anyone wants to hear from me direct, it's up to them to write now and again. I am not too bad. I have had, and in fact I still have a very bad cold and terribly sore feet from walking over the hard frozen ground.. Otherwise I am splendid. Well mother must close. Am sending you some views of London and the places I have visited together with some English papers. Well goodbye mother and father, sisters and brothers. Fondest love to you all. This is the last epistle from Tidworth for next Saturday we rejoin our units again. That means (1) no batman, cleaning boots, getting up early etc etc. It will hurt. Well mother the weather is getting much nicer now though it snows pretty constant still. Things are going from bad to worse in England. Talk about restrictions in Australia, they don't know what it is there. Here:- No soldier allowed in any public eating house or place of amusement after 10pm, only see eatables between the hours of 7am till 8am, 10am till 10.45am, 4.30 pm till 9pm. That's pretty rough isn't it. Can get practically no sugar. All cakes you buy are minus it. But with all this we manage to see only the humorous side of things. We have just received bad news of the reinforcement. They are said to have been nearly all gassed. No official news yet but hope it is not so. Everybody here seems to think the end is in view now. All returned men seem to be confident and they never wish to be back again as you will hear the papers state. Well, how is dear old home getting along? This is Easter Sunday. I can hardly realize it for we worked Good Friday as usual and do likewise tomorrow Monday. 2 - 1 - 18. Just a line or two to start the New Year. We have had a pretty fair time during this spell. New Year as you can quite imagine was not without its bit of jollification "Compree"- in fact some of the boys had a great liking to the Champagne Vin Mulago etc. Champagne was favorite for it is so cheap here. But one can make allowances for the exuberant spirit of the few under the conditions we are in. I'll now try and give you some idea of our last trip up to Fritz. First we are billeted several miles from the line- from here we tramp with full wardrobe on back to a like 2 miles or more behind the line where we take up residence in dugouts & are well within shell fire. At midday we go digging a cable for the artillery. This is digging frozen ground with snow frozen hand. Here you stay for say 7 days then pick up your bed & walk (at night in pitch darkness) over and in & out "Duckboard track" - like a ladder on rungs together for about 3 miles-rifle, ammunition, rations, clothes, water. We arrive platoon at a time at our destination & this is "Supports". We again get our dugouts & right away we get to work. 2 a.m pulled out on fatigue to take hot soup up to the line. Imagine this trip, 1000 yds off the line, pitch dark no regular track & ground torn up by shells. We wore thigh high gum boots & as there is so much traffic at night that for half way it is a sea of mud - a party of 10 men getting through this knee deep mud when out rattles Fritz's machine gun- down we all go- mud is far nicer than lead. Every time a Star shell goes up & lights the whole place up you have to stand- not budge an inch. Tis grand this 1000 yds-takes an hour & a half- 3 hours for the whole trip. Next night we get a change- sleep at day of course and out at dusk-this time tis raining and we are to mine No-man's Land- pouring rain and we are creeping along on our way to the job which of course has to be without noise- tis a great sensation to be laying in the mud and listening to Fritz spraying over the top of you with his machine guns. We get home at Midnight- mud head to foot and wet thro with not the slightest hope of drying your clothes which means for the next two days you are damp. And so the work goes on- fatigues-why would break a man's heart they come so constant. No-one who hasn't been thro the mill can have any idea what it is like. From here you go and do your turn in the line for 3 days and well this is putting you on pins and needles all the time tho sleep is soon the master and you can sleep thro all the noise of the day for from dusk till daybreak all hands stand to. Coming out the second time in we got spotted relieving and Fritz caught a couple of platoons in his barrage. Our platoon only had 2 casualties for we were lucky enough to be just behind it doing a shiver. I mean (....censored...). Tis hardly necessary to mention it but should you receive any news of me don't forget to pass it on to Menangle Mother for am sure they would like to know of it. Am Dinkum there you know so Don't forget. Well Mother nothing more to say at present. Just received another batch of 5 letters all dated March as late as the 12th. Have had several letters from S.Hill so I get you pretty regularly. I always look forward to your letter as I get all the news from you. 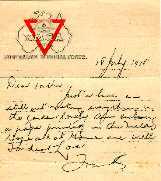 No, Father, I get no NSW papers as this is a Victorian Battalion. Glad to hear Mother is well and again settled in a home. Must congratulate Nellie on her success and hope she gets on well at the High School. Tell her to learn French and I can "Parley" with her. Am Tres Bon at it. Also a word to Keith about his exam. Am very pleased to hear he has passed the 25 words test. Hope he pulls thru the Educational Exam. About the expense of settling again Father the money of mine is for Mother to do as she thinks best and for her to consider it hers.. About that fatted calf- let him have a good go till Xmas 12 months for tis little use of building castles in the air for don't see the end in view yet. Am standing the strain fairly well. It plays up on the nerves very bad but so far I am OK. Shell shock is a terrible complaint and a common one. As you see letters addressed care Mrs Dickinson, London arrive earlier and tis far safer.I received Xmas parcel Ok. was a "Boska".Here's success to Keith's vegetable garden. Nothing like practice. Tell him to dig a strong post in the back yard and put a dugout in it with a waterproof sheet in it for a mattress then they won't need an extra bed and room for me. Well no more news apart from talk of German dead etc. Am writing this from Support trench on the S---- River in a Dugout made with a cover over the top of trench and a air -------- spring mattress. You may get extra news from the first 2 but just post the 3rd on to Ivy Cottage, Menangle. 27 - 5 - 1918. Well still going strong and am Tres Bon. Am out for a spell while the Battalion are in the line . This trip I am lucky getting left out so soon but I have seen as much as all the others now so tis my turn. Am glad to get out of the sound of guns again- first time since Febry. The weather is still holding good. Tis great Springtime too- light up till 10pm at night. Have had no mail for some time now but expect tis the push which has upset the business. Hope Keith was successful in the clerical for it will mean so much to him. Suppose Noel is back again. I received a letter from him last mail. He writes a very amusing letter. I like to hear from the children & am sorry cannot always answer them for tis hard to get material to write Home. How are you all at Summer Hill- now settled down OK yet. Any new enlistments round Molong way or any relatives? Was glad to hear Leo Smith got home safely. My pal Phil King had hard luck- got a Blighty in the leg but owing to the stunt was some days before he got proper treatment and twas necessary to amputate his left leg but he still writes very cheerfully and in the best of spirits. Next letter send a small writing pad with plenty of envelopes as tis hard up at the line to get writing material. This paper is a school kids tablet souvenired from a big and important place which the French have partially evacuated. Well Mother apart from letting you know I am well there is little news permissible so will close with fondest love to all at home. Received yours dated April 19th OK and was very sorry to hear of your misfortune that painful accident and hope ere this everything is OK again. So this is not the only place they get Blighties. Yes I guess the push of Fritz's made all home folk a bit anxious and at first things may have looked black but no all is well here. During the push t'was the devil's own job to get writing material so consequently was not able to write as regularly as usual. Just a line am still out resting everything in the garden lovely. Am enclosing a paper printed in the field. Hope all at Home are well. Fondest love. Vignacourt British Cemetery. Francis' final resting place. I am writing to tell you of the death of your son Cpl F J Mack. He was brought in here (61CCS) quite early on Monday morning, wounded in the abdomen. Everything possible was done for him and during the day he seemed to maintain his strength, but towards evening he grew weaker/ died about 8.30pm. I was with him two or three times during the day and again shortly before he died. It may be of comfort to know that I buried him this morning in a quiet little graveyard far from the noise of battle. His grave is well cared for and will be marked with a cross. May God comfort you in your trouble and grant to him eternal rest. I have just learned of the death of your dear, brave, splendid boy and I hasten to offer you my deepest and sincerest sympathy. Many months have passed since he left you, months of hardship and fierce fighting for he who answered his Country's call, and months of weary anxious waiting for the lonely mother. And now? There is just one more young hero sleeping "Somewhere in France", and there is just one more broken-hearted mother left to mourn the death of her soldier son, who offered his "very" young life so generously to Him who had given it and this is War. It is certainly very hard to resign ourselves, in our hour of trial, to the Will of God, but what an amount of consolation one would receive if one could realise that - "there are no errors in the great eternal place, and all things work together for the final good of man." May God, who allowed it, give you grace and strength to bear the heavy cross. Everyone realises that it is the mothers of those grand boys, who are the silent, hidden heroines of the world. The night was very dark and at first the shell-smoke rendered landmarks most difficult to see. As the German outposts were reached on the 29th's front, some of their garrisons ran towards the Victorians with hands above their heads, to be directed to the rear as prisoners. The Australian casualties, including those caused by the next two day's shelling were 266; of the Germans 4 officers and 124 others, with 36 machine-guns, were captured. 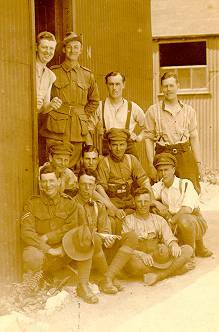 OFFICIAL HISTORY OF Australia IN THE WAR OF 1914-1918. 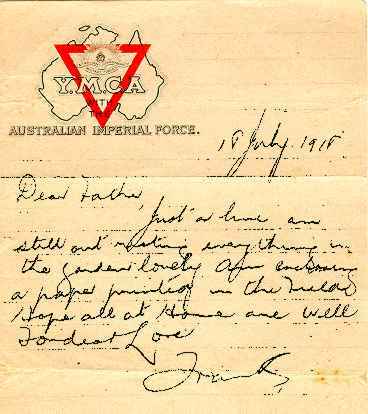 Published by the Australian War Museum.